In Rossini's Petite Messe Solennelle (1863-1867), sacred tones blend in seamlessly with allusions to his comic operas. "Is this sacred music which I have written or music of the devil? ", the composer tellingly asked himself in a personal letter. 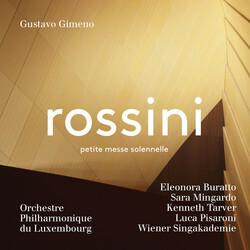 Rossini's enigmatic but highly enjoyable mass demonstrates his rich musical palette, ranging from "archaic" remnants of Bach, Haydn and Mozart to harmonic audacities that point towards the music of Faure and even Poulenc. Despite this stylistic range, the Petite Messe Solennelle sounds unmistakably Rossinian, and continues to enchant audiences to this day. Initially composed for a small ensemble of singers accompanied by two pianos and a harmonium, the piece is presented here in Rossini's orchestration. With this Rossini recording, the Orchestre Philharmonique du Luxembourg and its Music Director Gustavo Gimeno continue their acclaimed PENTATONE series of composer portraits that already featured monographs of Shostakovich, Bruckner, Ravel, Mahler, Stravinsky and Debussy. On this album they work together with organist Tobias Berndt, the Wiener Singakademie and a quartet of outstanding soloists: Eleonora Burrato (soprano), Sara Mingardo (mezzo-soprano), Kenneth Tarver (tenor) and Luca Pisaroni (bass).